Feature SUPER MECA, Marunaka`s new basic machine ! High rigid and stable machine form promises best surface finishing. The turn-table permits the bias angle to vary 0º ~ 60º according to the material. Auto-return (once, twice or repeat) or One-way surfacing can be selected by micro-computer. Machine operating status is shown at monitoring lamp. 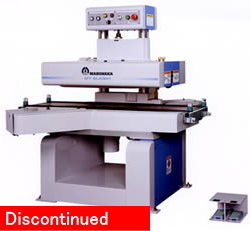 Feature Unique and patented "SLIDER" system employed which performs forward and return cutting with separate knives, which realizes the best finishing quality and also extends the life of the knives. A combination of five cutting methods and four reciprocating frequencies can be selected by micro-computer control. 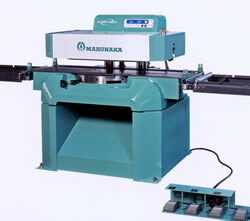 This high perfomance machine provides a superior finishing by once putting the material. 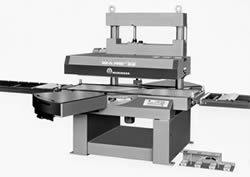 Unique and patented slider system, which performs forward and return cutting with separate knives, also extends the life of the knives. All operations, such as head uop/down, feed start/stop and discontinue of reciprocating are performed by foot-switch for excellent operability. Feature A combination of five cutting methods and four reciprocating frequencies can be selected by micro-computer control. 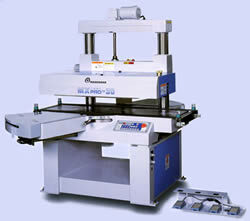 This high perfomance machine provides a superior finishing by once putting the material. 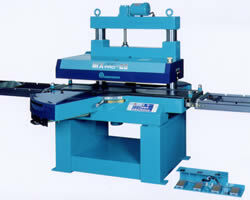 Unique and patented slider system, which performs forward and return cutting with separate knives, also extends the life of the knives. All operations, such as head uop/down, feed start/stop and discontinue of reciprocating are performed by foot-switch for excellent operability. Feature A big & heavy duty super surfacing machine !